Hair spray products can set a style, hold a style and help you style. They are categorized by how strong of a hold that they provide. Hair spray products can also enhance shine, reduce frizz, include light reflecting ingredients, a water resistant formula to fight humidity, or a combination of these. Typically, silicone is the primary ingredient. Volumizing hair sprays help to counteract the weighing-down effect that many stronger hair sprays have by utilizing slightly different ingredients. These are typically available in medium to maximum hold, and help to coat the roots of the hair, lifting them up. Some products utilize lightweight ingredients that expand once dry, giving hair body. In general, these types of hair sprays are meant only for the roots, although they can provide hold to the rest of the hair without weighing it down when applied sparingly. Flexible or working spray is great for holding curls, waves or flipped ends, i.e. when you want to maintain your style but still have hair move freely. Medium hold works best for shorter hair and softer up-do's. They are meant to finish your style so you should not mess with the hair once it is sprayed. Maximum or firm hold are the strongest and are meant to be used when you want to hold every hair in place. Innovative hair sprays prevent hair strands from sticking together. To take advantage of these formulations you must however hold the spray nozzle at least 12" away from your hair and keep the spray can in constant motion. Before using the hair spray, make sure that the spray nozzle is not gummed up. Otherwise, the hair spray will not leave the can as a fine mist but rather in sticky spurts. Give your hair more volume: Shake your hair while holding your head upside down. Then throw your hair back again without too much force. Lift individual strands of hair, and from a shorter distance apply a little hair spray underneath the strands. Allow the hair spray to dry before moving to the next strand. Tip for women with bob haircuts: Slightly lift the covering hair and apply the hair spray at an angle from below toward the hair ends. This provides marvelous hold to beveled side hair. 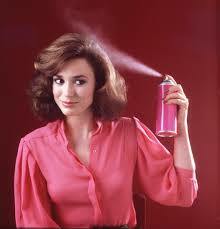 If you have a sensitive scalp: Hair spray contains alcohol and therefore dries the hair and scalp. You should therefore apply the spray only to the hair ends or use an alcohol free spray. You can give hair a lot of hold and bounce by spraying it liberally over your hair and then either put heated rollers into your hair, use a curling iron or pull the hair ends through a flat iron. Then apply some more hair spray to give your hairdo hold. This is how it is done backstage for the big fashion events. If used unobtrusively, hair spray also helps against oily hair roots. This is a nice trick to know in case your fringes tend to look oily before the rest of the hair. Simply pull the freshly washed fringes over a round brush to keep the hair away from the skin and apply a small amount of hair spray. Hair spray can also give eyebrows a beautiful line. Simply apply a little hair spray to an eyebrow brush before using it. Help! Grey roots are showing! 8 Signs that you need a hair cut. The Split Hair Dye - Simply Gorgeous! Ten trending colors for fall 2018! Time to Glam it Up! Ready to apply gorgeous polish...uh oh...a snag!